At the Canucks Summer Summit – aka the State of the Franchise – the Canucks announced the start of a new tradition, the “Ring of Honour”. The Ring of Honour initiative will launch this season and is intended to celebrate and salute Canuck heroes who have made a lasting impact on the franchise. The plan is to honour 3 or 4 players every season, and give fans a chance to acknowledge their contributions to the Canucks community without retiring their jerseys. While the first “Ring of Honour Night” isn’t until October 26 when the Canucks will honour Orland Kutenbach, I imagine the concept is similar to what the Toronto Maple Leafs do. Besides Kurtenbach, the Canucks are planning on honour three other former Canuck heroes. The team hasn’t announced their names yet, but we give our two cents on who we think are most deserving of this honour. Cam from Canucks Army: I like this tradition. Retiring jerseys should be reserved for an incredibly special, elite group of players. But the franchise should still honour players that have left a special mark on the team and its fans. Kurtenbach is a perfect choice to start this tradition. Bure is another great selection. I’d also add Snepsts, Odjick, and McLean. Richard: I think it’s a neat tradition so long as they don’t do too many a season. You start to run out of players otherwise. I think this year they’ll honour Captain Kirk, Roger Nielson and Pavel Bure. Chris: So long as the Ring of Honour is done the right way – essentially any way different than the “7th man” – I have no problem with it. I think it serves an excellent purpose to recognize Canuck players who have contributed to the success of the team on or off the ice, while preserving the sanctity of a retired number. As for who I think the other three names will be, I asked the Magic Eight ball for help and came up with the following: Thomas Gradin, Harold Snepsts, and Pavel Bure. Yep, I’m that darn good. J.J.: I think this is a great way to honour players. I agree with Cam that retiring jerseys should be reserved for special players, and I think it’s certainly fitting for guys like Stan Smyl, Trevor Linden and Markus Naslund. 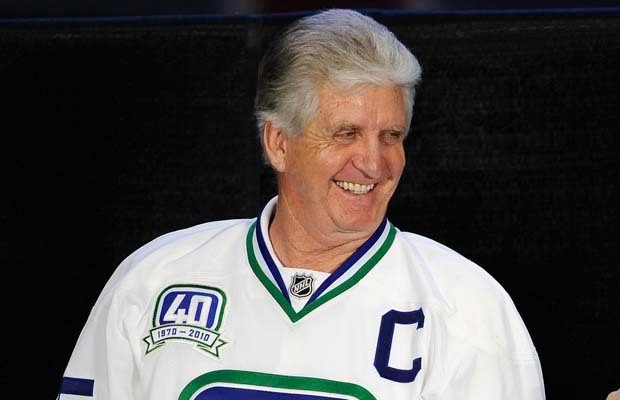 However, there are many others who meant a lot to this franchise and have contributed greatly to the Canucks community, but because they don’t necessarily deserve to get their jerseys retired, we don’t get the opportunity to thank them and celebrate their contributions. After Kurtenbach, I’d like to see Jim Robson, Harold Snepsts and Richard Brodeur honoured as well.